[Updated with photo & video] Just past 6pm this evening [Mar 10] Marico Bassett was found guilty on Count Three, which was a charge of unlawfully possessing ammunition. He was not, however, found guilty on the attempted murder charge, as the jury was unable to reach a verdict. A retrial was ordered. Count One was a charge of attempted murder, and Count Two was a charge of using a firearm to commit an indictable offence. Mr Bassett will be retried on both those counts. He was remanded into custody, and sentencing on Count Three will be done after the outcome of the retrial. Randy Lightbourne, 45, previously told the jury that he had recognised Mr. Bassett when the alleged gunman rode a motorcyle into the parking lot of Somerset’s Charing Cross Tavern at approximately 5pm on July 23, 2010 and began shooting at him. Mr. Lightbourne, who was shot 7 times, spent months recovering from multiple gunshot wounds. 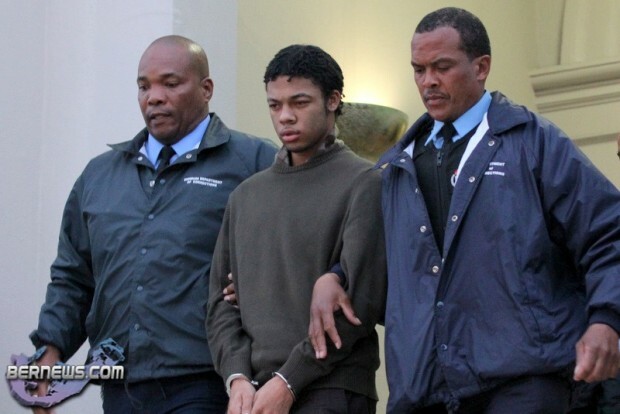 Mr. Bassett, 20, was taken into custody soon after the shooting and charged with attempting to murder Mr. Lightbourne in July 2010. During the trial, the jury heard that the gun used was linked to multiple West End shootings — including last month’s murder of 29-year-old Colford Ferguson. During the summary, Crown counsel Carrington Mahoney said the defendant allegedly shot Mr Lightbourne to “move up the ranks” of a west end gang he was said to be a member of. Did you influence the Jury? How? Was there enough evidence to convict without reasonable doubt, or is it that we in Bermuda think that everyone on trial is guilty anyway. There was bits and pieces of strong evidence, which many of you think is solid proof, but it wasn’t enough to convict. At least we know that the jury had a long and hard think, and didn’t jump to a conclusion. What the hell was the ammo for?????? It’s not the courts, it’s the investigation that provides insufficient evidence (i.e. police). There we go blaming the police AGAIN, Its the DPP who take the evidence from Police and deem it sufficient enough to take to court. So if you want to start pointing fingers start there. Police got the right person who did it. It is up to the DPP to prove it in court! I,m thinking that the Jurors realized that the victim only had one working eyeball and coundn,t possibly without doubt, positively identify the shooter.Good job members of the jury,you,ve rendered the best judgement given the salient facts.Now come on Mr.Daniels and get this young man back into a productive society. I guess..if you like that type….. The problem with the jury not reaching a verdict on the attempted murder charge or him having a firearm was just what please? What would the jury like? HD video? Circumstantial evidence: check = reasonable double: check = hung jury: CHECK! Totally agree with you T Walker!! wasn’t solid enough…Was only able to identify him from his nose and mouth as visor was covering his face (remember he is blind in one eye) secondly expert did say that even though there was residue found it did not mean that he actually fired the gun as the residue is easily tranferable if coming into contact with someone else and thirdly he is not the only left handed person on the island…not solid enough!!! That’s what I’m wondering. If that’s the case no one will ever be convicted. The man who was shot identified him, on top of the other things you mentioned. Yet they’ll still call out for the public’s assistance in future cases. What more do they want when the actual victim saw him with his own eyes etc. Things will just get worse. Get your facts right. Don’t believe everything you hear on the news and read in the newspaper. Well what’s the facts? Where does Bernews get their facts from? Thin air? I appreciate that each one of has a voice and that each one of us is entitled to our respective opinions. I was the defence attorney in this case. I tip my hat to the Crown Prosecutors because they did an amazing job in presenting their case in a dignified manner. Likewise, the Bermuda Police Service must be commended for their hard work and dedication, as should the Court staff who all participated in our process. The manner in which this case was publicized was not balanced in my respectful opinion. The public did not hear all of the evidence as it was presented in Court and therefore the public are entitled to question how the jury returned with a Hung Verdict. However, I write this piece to applaud our fellow citizens who served as jurors in this case. All I could ask was that they took their time to consider the evidence carefully and dispassionately. The jury clearly took their time (5 hours) to probe and challenge the evidence; and ultimately, reach their decision. I for one am grateful that they approached their duty with such care. I can only imagine the burden a juror must feel to judge one of their fellow citizens and that is why I believe that they are the real heroes in this case. In this current climate, it is not easy for any individual charged with a crime to come before the Courts; especially gun crime. The matter is still a live issue, so I shall not comment any further; however, the Community must have faith in our judicial process. Not every individual who is brought before the Courts is guilty. Not every accusation is true. I know that crime is a dilemma which affects each of us in different ways; but before we judge the cover, let us at least take the time to read the book. Justice was served according to the evidence provided. Job well done. Justice Was Not Served…I’m No Lawyer But Is It Not Correct That He Was Not Charged For The Right Thing Based On The Evidence They Had. You Cannot Attempt To Murder Someone Without A Murder Weapon!! I can’t say for sure one way or another whether this young man was guillty or not. What I would like to point out is that “justice” is a term that is loosely thrown around today when it comes to court cases. “Justice is what should be administered based on the TRUTH” too often what we have are defense & prosection lawyers that are not interested in “justice” but in winning. If a client is guilty, “justice” doesn’t deflect and attempt to cast blame on someone or something else. If a defendant is innocent,”justice” doesn’t attempt to railroad him with false evidence. “Justice” meets out punishment or vindication because it has heard the unadulterated truth. Just because a verdict is handed down doesn’t necessarily mean that “justice” was served because if it wasn’t based on the truth of actual events then all you have are winners and losers in the “sport of law” as oppsed to “justice ” in “the courts of law”. How much time do you get for ammunition? a couple years per bullet? According to this it should be not less than 12, not more than 17 years. If he doesn’t at least do time for the ammo then we will see how much of a joke the court system is! Good evening. I truly do not want to engage in a debate with Triangle. My point is- if you are not in court privy to all given information it is hard to judge fairly. As a former juror a few years ago I realized that so much goes on that we don’t know or is at times incorrectly reported. I just ask that you think about how clearly the victim could make an identification given his own limits. I was not at the incident and cannot make a fair assumption. Both sides from what I saw presented their cases well. THIS ISLAND IS DISGUSTING……SMH!!!!!!!!! !…….AND WE WONDER WHY THE SHOOTING WILL CONTINUE…..WTF!!!?? Money. Isn’t that one of the many roots of evil? Unc – How do you earn a living and would you defend yourself in a criminal case against you or a cherished family member or friend? I don’t earn a living by defending rapists, murderers and thieves is all you need to know. How do you earn a living? I’d never be hauled into court for such a matter. If I knew my one of my “cherished” family members was guilty no I wouldn’t. Did you get the answers you were looking for? Inetersting comment.Sounds like the sinner that cries for Jesus on his death bed. The evidence was clearly weak, heavily reliant on the the person that was shot and it was obvious that this was no slam dunk case. Unless I have been reading the RG upside down, the majority of recent cases tried have ended in convictions. Its innocent until proven guilty. The news paper lacked information but it was easy to pick up on the fact that there was no evidence connecting Marico to the shooting. There were also facts such as, the bullets “probably” were a match. it doesnt “necessarily” mean that he shot…that means no.The victims story wasnt straight either, how does one see the nose and mouth of his shooter but fails to identify what colour the helmet and bike were? Marico has words across his hands that the victim saw yet they didn’t find gun residue on his hands. The only reason why the victim was able to comment on so many of Marico’s characteristics was because he knew him. I believe he was mistaken and the prosecution knew that they didnt have a strong case and threw in aspects like “he’s an MOB gang member” “the gun was used in two other shootings” “he had blood on his pants but it was his” allll irrelevant factors. I know that the presence of guns in our community is poison and we would all like it to stop but if we become biased and choose to overlook the facts then wouldnt that make us the same as the shooters by being unfair and neglecting our principles? And defence lawyers are not LIARs. I am studying to be one and everyone has the right to be represented in court. Just because the prosecution brings you to court, doesnt mean you are guilty. They have a duty to prove their case beyond all reasonable doubt. Good point, but if your studying to be a defense attorney then you must know that a good portion of your clients will be guilty of the offense and solely need a good “liar”, I mean lawyer to get them out of the situation. Lets keep it real now. Yes, but I do agree that ALL are not guilty of the offence that they are being charge for and deserve representation. Marc Daniels, really and truly you’re only writing this letter for publicity. Who cares if you was the lawyer. Now go represent all the clowns, joker…..
From past experience with the press I am well aware of balance problems in reporting a story. I would hope that the press can at least get the major points factual. If the penalty is 12 years, after time off as usual for good behavior, I guess it is not much less than if a guilty verdict had been reached after after the other charges would have had concurrent sentences. The annoying thing is that it all goes to trial again at humugous cost at taxpayers expense. As someone who served on the jury who, was not privy to read the articles published during the case until today can tell you that Mr. Daniels is correct. Not all of the evidence that was presented in court were published in the papers. many of the articles had a slanted view (towards one side or the other), thus not painting a full picture of what went on in the courtroom. Some articles gave information that was completely incorrect. The bottom line is some jurors were convinced of guilt others were not convinced beyond a reasonable doubt. Unless you are sitting in the courtroom getting all the facts you cannot truly surmise one’s guilt or innocence. Every juror, with the exception of a couple who had their minds made up by day 2 truly took their time and listened to both sides presented. Considered all the evidence, sifted through all of the speculation and opinions and made their decision. As a first time juror, I applaud the other jurors, the Crown Prosecutors and the Defense. Fortunately, or unfortunately, depending on which way you look at it, the evidence submitted was not enough to convince the majority of his guilt. This is PATHETIC…bottom line. Sad to say, its not what actually happened but what can be proven in court! However, I figured that by Mr. Lightbourne identifying the shooter was more than enough, o especially being that he KNOWS HIM PERSONALLY! Left handed…Gun shot residue on the clothes that he had on….And this wasnt enough for the jury to convict??? Now you see while people take the law into their own hands..i.e an eye for an eye. Good luck to this little island..this will only get worse! Lightbourne identified Bassett by seeing his nose and mouth under Bassett’s visor ( his words )…Joker – are you saying that this is conclusive??? Pleaseeeeeeeeee. Randy has known him for years. Can yoi identify one of your friends if you only saw half of their face…um I think so! Giving the benifit of the doubt it one thing but being realistic is another..Tune in! @thisisajoke u know Randy personally?? or you just going by what the paper reported the (bleep) said in court?? Don’t worry folks, within a hundred years we’ll all be dead and none of this will matter. Enjoy your life while you still have it – we’re not here forever. How people are getting out of Jail for muurder is ridiculous in other countries that amount of time is given to lower case of crimals,you can get 10 – 12 years for much smaller things in bermuda you get 11 – 12 years for Murder and some end up getting out in 7 years maybe less because as a society we forget how horrific the event was 7 years ago and they are able to be released without it getting a lot of attention because people forget. Where any of the members of the jury smokers? I was on a jury with several smokers who were not allowed to smoke for the entire day and that, in my opinion, affected their judgement and debating of the case. Once the nicotine cravings kicked in, all the smokers wanted to do was get out of the room and they didn’t care what anyone wanted to discuss. They just wanted it over and done with just to get out and have a cigarette! Hopefully those rules have changed and smokers are allowed to get their fix during the day. @ skeptical….interesting and valid point. I’ve seen smokers act worse than crack heads when they can’t get that nicotine fix on time and they will and do say whatever they feel will get them that hit. all rationale goes out the window! The guy who got shot has a criminal past and im 100%sure that that was on the jurys mind as well,(thinking to themselves hmmm maybe he deserved it) Look its this simple, …a man gets shot at the park at 2:00pm, thinking that he is going to die he tells whoever he can who he saw shoot him, He survives, the police arrest the person who the man identified, the man has GUNSHOT RESIDUE on his clothes and ammunition be it the same ammo that was used or different. Question??? You are identifed as the shooter what is gunshot residue doing on your clothes? Ohhhhhh its a COINCIDENCE the victim just happened to call your name, you just happened to have gunshot reside on yourself, you just happened to be left handed, Ok i understand why you could give a guilty vertic???????? ?